Whether you're a professional presenter or simply give the occasional report, looking your best is vital. The ShowStyle®'s clean, modern curves bring a definitive ‘style’ to your presentation. There's no need to assemble awkward and clumsy panels, ShowStyle® unfolds from a briefcase to a 48″ × 24″ tabletop display in seconds; and the new, larger Pro32 model is 64″ × 32″. Photos, charts, signs, or other visual aids may be attached to the fabric panels using Velcro adhesive dots. After a presentation, ShowStyle® folds back into a ‘briefcase’ with attached visual elements still in place. 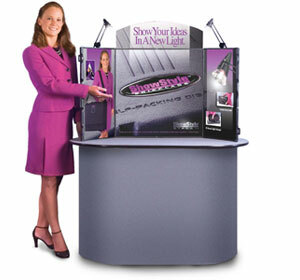 Other ShowStyle® packages include two LumaStar™ 12V LED lights and a carry case. Graphics grab more attention when illuminated, and the lights store easily and safely within the case. 48″ wide, includes full printed header and panel graphics. 48″ wide, includes two LED lights and a canvas carry bag. 48″ wide, includes full printed graphics, two lights and bag. 64″ wide, includes full printed header and panel graphics. 64″ wide, includes two LED lights and a canvas carry bag. 64″ wide, includes full printed graphics, two lights and bag.